My to-read list is exploding with great sequels and fabulous new authors. I have caught myself multi-reading again. This, unfortunately, means I never seem to get to the end of any one book. Great for me as I am constantly enjoying inspirational stories and other worlds. Bad for my blog because I have nothing to post. So I will stop and take a brief moment to promote a book I am very excited for next month. Now a simple two weeks away. 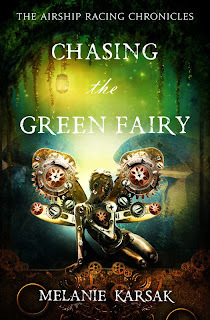 She revealed the cover art for her follow up novel to Chasing the Star Garden, which I gave a glowing review here: http://bookworminthestars.blogspot.com/2013/12/chasing-star-garden-by-melanie-karsak-i.html. Check out this amazing cover. It definitely piques my interest to get this thing pre-ordered. Can't wait! Chasing the Green Fairy releases Tuesday, March 4! Are you ready for some Spirit? Oh how do I write this review?